The Black Death, or Bubonic Plague, swept through Europe like a wildfire. It originated in the east, and was carried to Europe on the trade routes where infected sailors arriving on ships brought the plague to European ports. From there is spread into Europe killing about a third of the population. Entire villages were completely annihilated by the plague. As gloomy a tale as this is, there was also a positive aspect to the plague. After the plague disappeared Europe entered an era of economic boom. Due to the shortage of labour – many of whom had been killed by the plague – peasants could charge for their labour, and were compensated, whereas before they worked for next-to-nothing. With the new boom, new ideas started blossoming and this introduced new perspectives into their world. The plague was indiscriminate. It did not target specific groups, and nobody was immune to the long, black fingers of death. Almost everybody lost someone to the plague. Endings came to all, nobility and peasants alike, regardless of how prepared they were. However, in the end Europe came out stronger than it was before. The plague also caused many peasants to question their religion for the first time, they became untrusting of their religion when ‘God’ had failed to protect them or come to their aid as the Black Plague swept through their villages, killing off a third of the population. The church suddenly no longer enjoyed subservience and obedience from the peasantry, and thus had to have a heavier hand in the suppression of its people. As a result of the questioning of their faith, movements and sects started to form and the church saw large flocks of members moving away from the church to towards these different sects as people were looking for more than the church could offer. It does not matter how well prepared we are, sooner or later tragedy strikes us all. It is how we deal with it when it happens that is important, so that we can emerge stronger on the other side. When tragedy strikes we react, which is very normal. It is however wise to keep some measure of check on our reactions, we need to know when to stop grieving so that we can open the next door presented to us and step through it to into a new phase of our lives. Because with endings come new beginnings too, and this is in essence what the Death card addresses. Endings of all sorts, be it the ending of our current employment, our relationship or the physical death of a loved one. We should not stop living because we have lost someone or something, we should take the time we need to grieve this loss, yes, but then we should focus on lifting ourselves again to step over the next threshold to embrace the new things that life has in store for us. 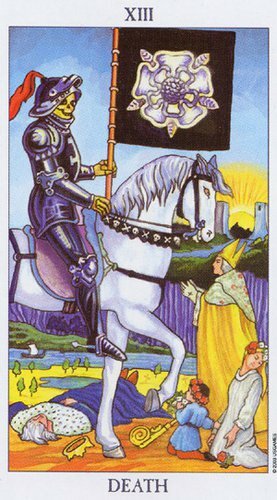 As gloomy as the imagery on the Death card appears to be with bodies lying everywhere, a priest begging in vain for mercy while Death rides through on his steed; on the horizon the sun is rising. A bright golden orb of warmth and hope starts to dominate the sky again. Signalling new beginnings in the aftermath of the endings that Death brings. Growth almost always comes from death and endings. Some things are forever changed, cures are found, prayers refined and people forge on towards the next chapter in their lives.